Well equipped for a connected life, the N2310 not only offers users access and control of their files over the Internet, but is also able to stream stored media to Android and iOS mobile devices. And if you’re one for sharing and downloading files online, just drop the seed files into the N2310’sBitTorrent client and watch as this little NAS does the rest. But what about the setup? That’s where our Intelligent NAS utility comes in. Once you’ve connected your N2310 to your home network, simplydownload and run Intelligent NAS. It’ll automatically find your NAS and allow you to easily set up your RAID or JBOD volume. 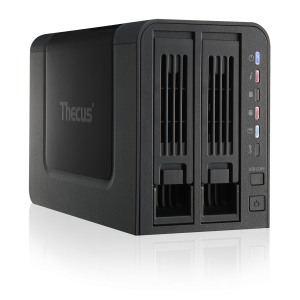 Once up and running, Intelligent NAS will also allow you to effortlessly connect to the N2310’s operating system, ThecusOS™ 6, where you can monitor, configure, and update your NAS and modules.